Calibrating transmitters, pressure sensors and manometers is easy. 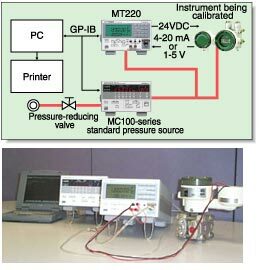 Simply combine the MT220 with a standard pressure source (e.g., MC100 series) or a handheld pump (e.g., Model BA-11). You can also automate your calibration system by integrating your PC and relevant equipment with the system, making it ideal for a calibration laboratory, for example.